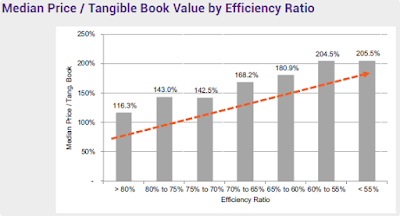 For Financial Institutions, What Drives Value? 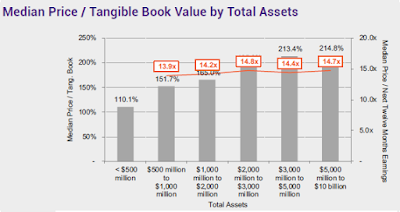 - The Kafafian Group, Inc.
Home > Insights > Financial Advisory > For Financial Institutions, What Drives Value? Not all financial institutions are publicly traded. But there are enough of them to help those that do not trade to measure what metrics drive the value of their franchise. 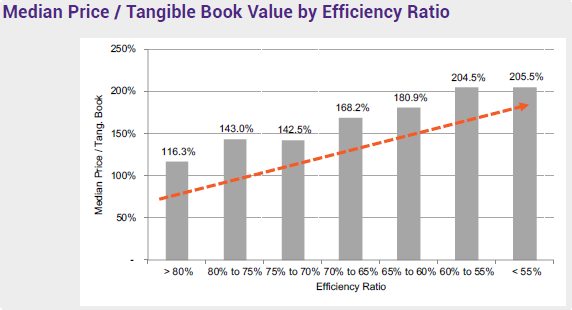 So what metrics drive value? Umrai Gill, Managing Director of Performance Trust in Chicago presented his findings to the Financial Managers Society at their East Coast Regional Conference this month. Some results were surprising. 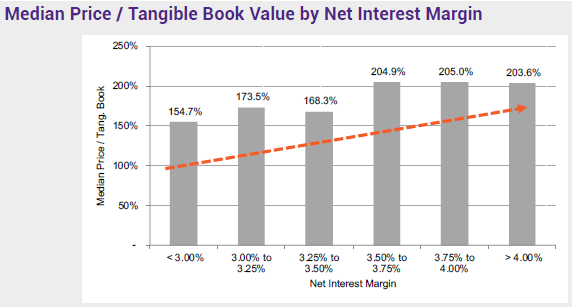 He first cited a survey performed by PT, asking their clients “what are the generally accepted drivers of institutional value?” Without identifying ranking or more details about their survey, the preponderance of responses were as follows, in no particular order: loan-to-deposit ratio, investment portfolio size, net interest margin, efficiency ratio, return on average assets (ROAA), return on average tangible equity (ROATE), capitalization, and asset size. Some were not very interesting to me, such as investment portfolio size, which might have been influenced by PT’s specialty. 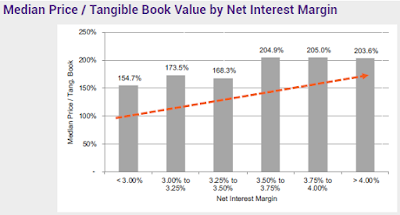 Others might have been too investment community-like, such as ROATE, which doesn’t count high premiums bank buyers pay for bank sellers that results in goodwill on the buyers’ books, which is deducted from their regulatory capital. But others struck my curiosity to see if there were correlations between the metric and market valuations. And I thought I would share with my readers.The charts in the slides below was PT’s analysis of data from S&P Global Market Intelligence based on June 30, 2018 financial information using market data from 08/17/18. 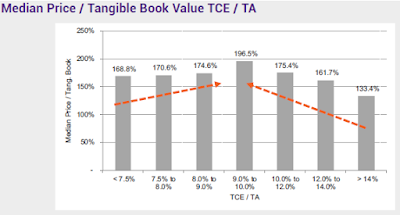 First, the metrics that showed correlation to price to tangible book values. Not surprising, in my opinion. 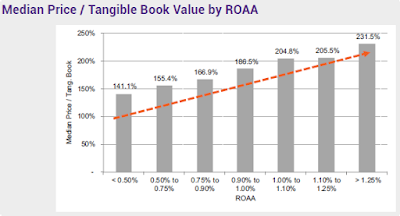 Next, the ratio that did not show a correlation to price to tangible book multiples, at least not over 3.5%. I was a little surprised at this one. Lastly, and most interesting from my point of view, were ratios that showed mixed results. 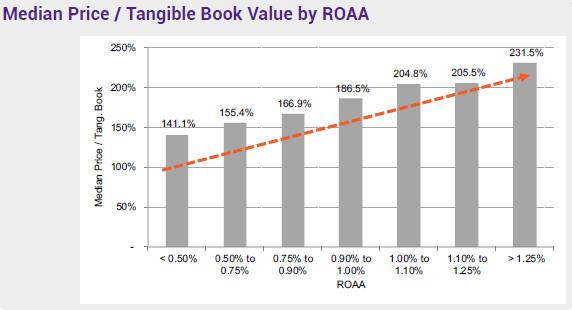 In other words, they showed positive correlation to price-to-tangible book ratios, up to a point. After which, they showed a correlation, but not what bankers would hope for. 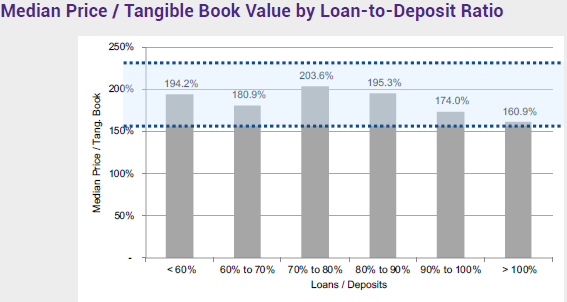 The highest market multiples were afforded to banks with a 70%-80% loan to deposit ratio. Now that may be related to size of institution, as the very largest, JPMorgan Chase (67% loan/deposit ratio) and Wells Fargo (76%) tend to have lower ratios. 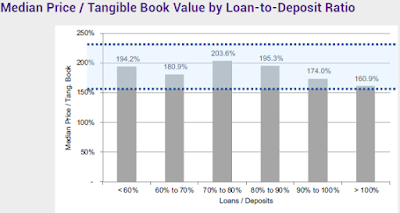 But there is likely something to the fact that a bank that still has strong liquidity as represented by a relatively lower loan-to-deposit ratio in a good economy has room to improve earnings by growing loans faster than deposits. While the less liquid must price up their deposits to get funding. And capital, well, I refer you to a prior post where I clearly stated there was such a thing as too much capital. Investors will not pay a premium for hoarded capital. Performance Trust’s research puts that sweet spot in the 9%-10% tangible common equity / tangible assets range. 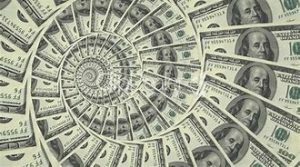 Enough capital to grow and/or absorb recessionary losses without selling off assets at a discount to bolster capital during hard times. Where are your sweet spots?